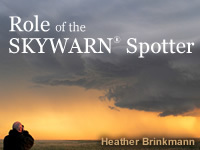 The goal of the "Role of the SKYWARN® Spotter" module is to provide baseline training for all spotters through multiple scenarios covering the procedures for spotting (including communication and storm report criteria), safety considerations for all hazards, and an overview of the national program and its history. Won't let me retake the quiz for this year. Having lived in Florida for 38 years, I learned alot esp living near the Space Center, about the weather and how quick it can change.Went thru 3 hurricaines in 2004 ,and helped provide emergency communications thru Ham Radio.My call W4RTL and thru React towers on 462.675 for Brevard County Emergancy Manangement. This lesson is well done. The lesson Helped me review for Skywarn Spotter requirements . I had no idea about skywarn spotters. It is fascinating and clever to know that there are people willing to benefit the community by promoting safety around others. It would be nice to know the correct answers to the quiz so you can learn from your mistakes. This is very important for those who are just starting and a good refresher with up to date information for the Spotter Veteran. Very informative information. Very interesting and engaging with practice questions. Overall good content. Some quiz questions confusing with marginally best answer selection. Excellent information. Organized and well presented. I would definitely recommend this. It may seem like some information isn't useful but when you start to spot storms you'll see the difference taking this makes. Quick simple and easy to understand. The lesson was very informational. This lesson was very interesting to learn about because it informed me that anyone can become a SKYWARN spotter with the proper training, however the only thing i found frustrating was that in the lesson it talks about all the hazardous weather conditions can be reported by SKYWARN spotters however, on the test there was a question regarding which is NOT a condition that can be reported and they were all conditions that could be reported so i left it blank but i still got it wrong. i just wanted to know what the correct answer was. Great for new weather spotters and a good review for those who have been spotting for awhile. Great Lesson really enjoyed taking course! I enjoyed this lesson. It is required for me through my college Intro to Emergency Management class. The quiz should tell you where you went wrong cause I CANNOT seem to find what exactly is wrong. The wording on the quiz needs to match that of the study material. Great training that was easy to understand. It was not clear whether or not this is the Basic SKYWARN Spotter class. Many of the answers to the early questions in the lesson would only be known by those who were previously certified. I would like more videos. It really helps in times of emergencies! Excellent at explaining the basics. Some of the pictures, graphs and diagrams are a bit old however. Took a local spotter class and have always been an enthusiast of weather. Also have a weather station at my home. A well put together training lesson. A overall good learning lesson for storm spotters. I was confused by how the material was presented and the questions asked. This course provides very good basic coverage of storm spotter roles and expectations. this was a good basic course, covering most of the necessary information. I would add some content to address the dangers of downed power lines. I think the videos should have a closed caption option for those who need it or like it. Overall I feel like it was a great learning experience and I liked the questions asked throughout the whole training. This course material was put together in a wonderful way that helped me engage my knowledge in regards to weather safety and also helped me to remember what specific information needs to be reported to keep other people safety. Thorough and easy to follow. I’m a current spotter and took this course as part of my recertification. Some pictures are a bit dated but overall a good course. Good, basic information for beginning Weather Spotters. Very informative and well worded lesson. Low stress course, very informative. Lesson is very well done. It is interesting and informative. Very clear, easy to understand lesson! This is a very good introduction to understanding hazardous weather. The focus on safety was detailed and valuable. Was very easy to understand. all was great, but having more than one choice on test questions can throw someone off. This course was a little to basic for my tastes, but I have informally studied weather for over 50 years. This section is useful in life. Great course, easy to understand. I never get tired of retaking this course as a refresher. Highly recommend to anyone! this was a great training. I absolutely loved learning and I’m definitely wanting to be a Storm spotter. This lesson was interesting in that I learned several things I did not know before. It was also interesting to learn new facts and also outdoor survival techniques (ACES). found the lessons to be interesting and informative. good suggestions for staying safe while watching the weather conditions. Great experience through my college. Recommend to any changing weather lovers such as myself. Well worth taking. It helps us to be aware of the need to be safe in weather related events. Some of the provided links are outdated. Good review of important WX information. The only area I see that could be improved are a couple of the quiz areas. The question pertaining to John Doe, is almost a “trick question”. Other than that...great job! I enjoyed training as a novice and certainly learned new things. The test seemed fair and as with any test, there will be tricky questions worded to test one’s observation. Test was taken after thoroughly reviewing material. easy to track and perform, fully recommended ! Please show correct answers to questions answered incorrectly. Although I am relatively new to "weather spotting", the information was good but sometimes difficult to understand. the information provided was direct and easy to Navigate. I have also referred others to this class, as it helped remind me and reinforce things, that I had forgotten. Just wanted to be able to protect my family and those families of my city. I thought the course was very informative and beneficial. Wish i had done this decades ago. I enjoy everything about the weather and look forward to being a registered spotter. A great lesson with excellent information! I enjoyed this leson very much and will continue to better my understanding of weather for my Law Enforcement career. A few quiz questions are difficult because there is vague warning and lots of different information being taught in the field. A good basic introduction to what a weather spotter does. Very good training tool. Easy to follow and learn as you go. Nice course. Very interesting learning format. Always interested in weather and excited to help. This is a great review lesson for a better understanding of how weather reporting is done. This lesson was informative, but felt a little disconnected. Useful, but could use polishing. A good foundation for dealing with dangerous weather. Perhaps a bit more accentuation on some of the key components. I loved taking this small quiz! I learned a few facts and tips I thought I already knew, but was 100% wrong! It was a great lesson! Some of the quiz questions need revision, especially the one about which of the following weather events is not a reportable event, then each of the answer selections were items that appeared on the huge list in the body of the lesson; there isn't a selection that is not among the reportable weather events (hail, thunderstorm, flood, lightening, snowfall amount, tornado). My husband selected lightening and it was scored as incorrect; I tried leaving it blank since we know that they're all reportable events, but I received an error warning when trying to submit my answers re: having left a question unanswered, so I went back to this question and answered it "thunderstorm", which was also incorrect....There are other questions/answer selections similarly needing correction. Test questions have too many choices. Study over the material more than once. I think that the information is proper for the training of spotters. Good basic introduction. Some of the quizzes may cover material only obliquely referenced in the accompanying material, so some sleuthing may be needed. Now I understand with more details the importance to be prepared for any weather situation and its consequence. Same questions wanted the best answer but also said check as many as was correct ! I don’t understand ? As a storm spotter I highly recommend doing these lessons to better help yourself with understanding everything that is asked of you. The lesson is a nice introduction into being a SKYWARN spotter. Some of the videos are a little cheesy and the production quality for the videos could be better, but in the grand scheme of things the lesson is very informative and gives very relevant information. Very informative and easy to follow lesson. The lesson needs to be more interesting. Quick, easy, and simple to understand. Very well thought out lesson. It is nitpicking, but maybe a more prominent display of progress would nice. Thank you. Good information, particularly for those in areas that experience fast-changing weather conditions. update and develop more interactive videos that do not require flash. Outstanding lesson, I know a lot more after the lesson than before! Good overall course. Does have some dated material in it though. To be a successful storm reporter these classes are a must. Excellent course I would recommend this course to all especially those who live in hazardous weather areas. I encourage others to take this course, even if only as a review. Always learn something. I was thinking that a more in depth study would be required. However, I am not an authority on what constitutes a spotter. It was a nice learning more about weather and the different ways to pass on the information. Keep up the good work. 73. A good course for spotter want to bes. This is pretty basic. Important to know but not terribly exciting. Nice, basic course. One of the quiz questions doesn't contain a correct choice for an answer. This format with both written information and video I found very effective in presenting the information. Good format for learning. Would like to see more details on cloud formations and examples of how to describe them in a report. Over all a good course that's informative and quick to work through. Good option for the course if you can not make it to the face to face spotter training. Awesome to take this online course. Learn something right away that you can use! Great introduction to Skywarn Spotter onboarding and an excellent refresher for those that my have forgotten. A great way to learn more about weather spotting! This Lesson was very informative and interesting I have been watching storms since I was in the 4th grade in the 1960s I'm now 63 and have been a serious spotter continuously since 1989 after I got my Amateur Radio License I also spent 10 years as a firefighter EMT. Great guidance, easy to follow along! I felt to quiz was quite discouraging, had to take it several times. Some answers were to vague, required an educated guess. Overall good information though. Good basic information. The Quiz and questions throughout were not cover in the lessons. Instead they required an educated guess. The course was informative. However, I felt the course didn't quite prepare me for the final quiz. I think some clarity around the types of weather events to be reported would be good. I thought this was a good lesson. it used a variety of formats. Being a CERT member in Hawai'i this was quite informative, and pretty relative, however I'd like to see different weather situations added. This lesson is a very good way for an individual like myself who is interested in taking a weather spotter course but does not have the time to take a four hour class in person. The information was very useful and gives me confidence at being more prepared in the future. Was expecting to learn more about identifying approaching weather patterns or cloud types. Just could use some updating and streamlining. This is a very interesting course with good info. Great course to learn and to recognize what to look for during bad weather. This is great! My Mother-in-laws told me to take this because I was interested in weather. It was a great experience! The baseline training information and safety precautions were good. Good information, I learned a lot. Very well setup. have taken many online classes and this course was laid out very nicely. The class was easy to follow and navigate. A lot of it was review for me because of my background, but I'd still recommend it. I am not sure there is a correct answer to the question with the Spotter, downed power lines, my spotter id is 845, etc. No combo of answers works. I think this course is excellent. Lesson was interesting and presented good information, particularly regarding safety. Some of the questions on the quiz seemed to fly in the face of the lists of particulars about reporting essentials and what should (vs can) be reported. This is useful to understand the criteria required in spotter reporting. Some info was a bit vague as to required, suggested and key. This is a very helpful learning experience. Great practical information. Recommend this class to everyone. On your quiz there were some tricky questions that could be answered multiple ways depending on your point of view. I understand more after taking the class. When I first started this Skywarn Training I started with limited knowledge now I have a better understanding. This would be a great teaching tool if there was a mobile version or format. Other than that this was a wonderful course. Well done. This program is helpful. Thank you! Excellent overview of spotting basics! I enjoyed the lesson, and will help my community and stay safe! My only query is why can't I know which questions I got wrong? It helps when reviewing the material. I thought the lesson was very educational and helpful. I was expecting a bit more actual Skywarn related material like identifying cloud types and weather. During the learning session I found the videos were AFTER the questions they were related to. so you are trying to answer a questioned that you have no knowledge of until after. I learned the general processes and requirements for being a trained weather spotter. The lessons were easy to follow and helped me understand more detail about the program. Relatively easy to work through. Format easy to navigate. This was a good learning experience. Adding closes captioning to the videos could be helpful. I would say add a live video (roll play) and have interactive parts in the videos. Some of the scenarios were unclear and left me having to guess the answers to the questions, but overall this lesson helped me pass the final quiz. great information, very important to have the 7 key reporting criteria memorized! I really enjoyed taking this lesson. I used to be a skywarn spotter several years ago and wanted to take the course again through the online webinar that was offered by my local weather office. However, due to severe weather events it had to be cancelled, and I opted to take it through the MetEd course. Anyone who would like to become a spotter needs to take this course. It is well worth it. If your lesson is intended to educate the student, then the incorrect answers SHOULD be provided, otherwise the student (me) does not know what they misinterpreted in the lesson. I thought a couple of the questions to be wierd, but without feedback of what was wrong I have no way of knowing if it's me or a misprint in the quiz. Video (actually mainly audio) is too slow. I have no idea which questions or portion of the questions I got wrong so I still don't know the right answers. Learned something relevant, and new. Nice layout and not to much information overload. Content is great and the module is put together well. The lesson often asked multiple choice questions just before the video. I feel they would have been more beneficial if they were presented right after. Good course for the newbie and a good refresher for those who have training under their belt. Highly recommend even if not going to be a spotterLots of great info for personal use. The lessons were very clear and planned out well. Useful introduction of basic concepts. Lesson plan does not make clear what might be the least best answer for several of the questions, especially ones which contain multiple checked answers in a question. Fun layout with useful diagrams! The lesson was great however I found the quiz particularly difficult, and I even took notes! Narrowing down the answers to no more than 5 options would be helpful. I feel liked I learned a lot with this lesson and would recommend it to others! I have taken spotter classes before. It was a great refresher. Overall a good introduction to storm spotting. Would like to see the correct answers in the quiz review. I am a ham radio operator, conducting sky warn nets. This sky warn spotter training gives me more confidence in my communication skills with NWS. A very good introduction to the role, quite comprehensive. It is easy to understand and not unncessarily complicated. While this may be viewed as basic information it is a good lesson to run through. I would like to share my weather data from my WMR200A weather station. I have been submitting those reports for over 6 years now and want to expand it to all that I can. I enjoyed this short course. It was informative and well presented. I would recommend that you take your time and enjoy learning he concepts in this course. The exam has some errata. Be careful. Otherwise, decent training program. Very nice course and well put together. Great lesson and information for anyone interested in working as a volunteer to advise on weather conditions affecting your area. Weather spotting is a great thing to do and getting back into it by this course is a good thing. This is a good introduction to Skywarn Spotter training for individuals with no prior Skywarn experience, and should provide a solid base upon which to base further training. I would definitely recommend this website and lesson to my peers. A complete review of the quiz results should have provided not only the correct answers but also a short explanation as to the reason for each. I was stupid on the quiz. It a lot of information but the quiz can be a little confusing but overall easy! I have been slowly getting into Storm Spotting for the last 2 years and still this lesson taught me more than i expected. It would be useful if we could be redirected to the text if the missed questions for review. Having a question marked wrong without learning the answer teaches you nothing. Very easy to read and understand. The use of video within was great as well.Information was portrayed in a great manner and applied directly to the learning material. This course was fun and interesting to take. i would add a bit more to the videos, to give them more of a realistic feel. Informative, but I believe it would be a little more helpful if there was more of an interactive component. Excellent course. I have taken the local Spotter training give in my area and this course helped me to understand better and take notes. Recommend. To me this material is interesting but this 'program' takes any real learning benefit out of it. I understand that this is a cheap alternative but nothing is better than a good personal interaction with a live person who is equally excited about this or any other topic. Clear and straight-forward lesson. Designed to help you succeed. Need to add an advanced section for more information. Good basic information here. I learned a few things in the process. Download elements links are broken. Questions on the quiz were somewhat ambiguous. I did not feel that the material presented was adequately represented by the exam questions. Content is fine, however I would like to emphasize that agencies tend to monitor telephone contact, official emails/texting, etc. over twitter accounts. Post the NWS telephone number! Very good information that is in an easy to follow format. Good in general; creates awareness of needed improvements. Has great base for learning about severe weather. I want to get into Skywarn , and this lesson got me started. Interesting and informative .Safety and the form for repeating hazardous weather is the first step to being a Skywarn spotter. Excellent course to become weather aware! The wording on question 1 in the quiz is weird, so plan on being confused by it! The content was slightly boring. I felt that the information was helpful though. i think going outside is dangerous and may kill other's. This is a good skywarn course. I could find no clear answers to a couple of the quiz questions. Questions should require definite answers instead of "close." I was answering a few of the questions correctly and was still marked wrong. The answers need to be improved upon. It explained a great deal about what a spotter needs to know and why. This lesson is outstanding and contains a lot of information that can be used to help others. Very well designed and informative! It was easy and fun. good learned some new information i didn't know. This is a Basic Level of training as indicated by the title of the course. However, I feel it should get a little deeper into the role of Spotters by offering more insight to actual weather conditions a spotter should look for such as wall clouds, rotating storms, downdrafts, etc. this has been a great experience and i have learned so many things. i encourage u to try it. I really think it's very useful for everyone to know. This was very relevant and great! I did not know much of the information on this site. It will be useful in the future. Pretty good course that covers the basic information needed in an easy to follow format. Knowing that it's not as important for you to memorize the lesson verbatim, but to learn how you will apply that information in real-life situations is critical for these lessons. For some of us, it's a method we've desired for a long time. The lesson provides valuable information. This lesson and quiz has given me a better understanding of the roles of a SkyWarn Spotter, happy to become part of this!! Very interesting - keep up the good work! I wish there had been better examples of required information when reporting weather. One question in the quiz did not match the information given - storm damage report (number of broken limbs, wires down) is not the same as TYPE of hazardous weather. While the TYPE of hazardous weather (in this case high winds) is required, the storm damages are appreciated but not essential, according to NWS. I have always loved learning about weather. If I was studying my major of Early Childhood Education already, I would have went to college for meteorology. I learned a lot about weather that I did not know prior to taking this course. A good, and valuable lesson for anyone interested in storm spotting and staying weather-safe. Very basic but still a good lesson! Solid lesson. Easy to follow. Need to make finding it off the NOAA website easier and create more awareness for the public to realize it's out there for them to use it. I'm an Occupational Safety and Health Specialist, promoting overall safety well-being for the company that I'm employed. I always conduct a Severe Weather Safety campaign in the spring. Have recently had several express interest in becoming Sev. Weather Spotters. It increased my already high stress level. This was more interesting than I thought it would be, I figured it would be dreadful but was very informative something great to know! This program improved my knowledge of a Weather Spotter's job. this was a very good course, thank you for the information. very effective for learning tool! The lesson provided very little information related to the topic and needs to be adjusted. Additionally some of the contact information to report weather is not accurate. This was very informative. I did not know that anyone could be a SKYWARN Spotter. Very good lesson. I enjoyed this lesson and quiz.It went threw every scenario and the right way to handle it. this was very informative and I enjoyed the lesson. simple quiz to complete, did not score well. This is a great way to help and learn. A simple course that gets the point across. It could use a serious redesign, but the fundamentals are present. An excellent presentation. I would even rematch it to gain a little more insight. The info is a combination of commonsense and patience. Don't forget situational awareness! People take things for granted, and basic information as in this program can be lifesavers. This was a great refresher, I haven't completed this training in many years. I cannot wait to get back out there. I have been through Spotter training before in person. This was very well done, but there is some disconnect between the information covered and the answers expected in the quiz--nothing major, but there are some things that are less than completely on point. Good work folks, you're doing great! Pretty basic stuff. Don't do this if you're looking to become a "storm chaser" This is a volunteer based "spotter". Spotters are for safety. I would like to see the quiz follow the information provided in the quiz. I received 3 incorrect answers and I believed them to be correct based on what I documented from the lab. I enjoyed the course and the flex ability of it offered online. Great lesson, easy to follow. This is an excellent way to reinsure that spotters are properly trained. Some information was not covered when it came to questions. Overall, good information. It was a good lesson where you learned a lot of good stuff and can help me in my class. Questions 1is eitherlooking for an answer to discussed or mark correct answer wrong. Question 2 answers are all allowed but question want an answer that is not listed in the answers. A good foundation balancing getting the information as well as remaining safe. In my test results, I would like to see the specifics of what part of the answers were wrong and why. Basic common sense information presented. A good starting point. Very informative, the lessons are easy to follow along with and are to the point. This is a quick and fairly easy training method. The intro gives you a brief and handy outlet for what a spotter's responsibilities are, who to report weather conditions to, and how to do it. This is a great introductory lesson for spotters. It is easy to use and understand. Good material. Will recommend to others. We are using the Weather Spotter program to improve our preparedness. This site has some awesome resources and is very user friendly too. Very easy to learn information, especially with the video examples. I am the Deputy Chief for Hanover Township Emergency Services and we use this course annually to certify our members to function in our weather spotter roles. I really enjoyed learning more about severe weather. Some of the questions on the quick did not seem to match up. This lesson would be easily understood by someone with no formal education in weather spotting. I have formal spotter education but still found useful information here in the lesson. Live in a hurricane area need training. I’d give a 3 re-take limit, and then give the correct answers. It is awesome! I like being able to do this online! Video's could be modernized - updated. Very useful to understanding the role of SKYWARN spotter. This was a great way to learn about becoming a Skywarn Spotter. Overall pretty good. Some of the video content could have been done better. Leave out the story telling and create clear and concise enabling learning objectives. Good data. Like emphasis on safety. Good focus on personal safety. Clear explanations about what items to observe and how to make reports. Excellent tutorial, I really did learn more about spotters than I thought. Being from Texas I have always been amazed at the weather and a bit scared of it too. A new understanding. This course covers all the topics in the SkyWarn spotters guide. It uses videos and scenarios that bring the content to life. I would recommend this course to anyone who intends to become a NWS SkyWarn spotter. The information was very well presented. I learned a lot. I felt this is a great program. good way to learn the material. Progress at your own pace. Questions were worded confusingly and not in line with what was taught in the lesson. The quiz questions (all of the correct answers) do not always reflect the lesson content. I feel more comfortable in my effort to becoming a storm spotter. This was a basic knowledge of information, but I felt I gained a decent amount of information. I enjoyed the online class. I just hope it does not totally replace the NWS classes that are being held. very good fast easy understandable lesson. I ENJOYED THIS TRAINING SECTION. IT IS VERY CONVENIENT TO BE ABLE ABLE TO TAKE THIS COURSE ON-LINE! It was not too difficult and pretty enjoyable to do. I even had my son paying attention to the course. I enjoyed this lesson. I have never taken this type of class or a class at this site before. The site was easy to follow and use. The only issue I had, was that my computer rebooted and nothing I had done was saved. I had to start over and answer all of the questions again. Great information. Not something to be hurried through. Requires full attention and study. Reasonably well done lesson, but does not clearly address some of the questions on the quiz. Certainly worthwhile though. Once completed, you'll know what to report and that personal safety takes priority. Good short video clips!! I think this is better than the Class! Usually take the SkyWarn class in Texarkana.....but others that have taken it like this recomended it....A real winner! If you are interested in weather, then TAKE THIS COURSE !! Good lesson, quiz portion was a bit strange, should provide correct answers if it thinks you missed some. After course review, I still don't know why it states that I missed some questions. This format os most helpful to m,e. Makes mr consider right and wrong options. Some of the situational clips are slightly difficult not to be distracted by, however they are informational and furthered my knowledge in weather. It would be nice to see what the correct answers are for the questions I got incorrect. Easy to navigate, but I still can't manage to answer one of the questions correctly based on the information provided. I enjoyed the information presented in the lesson and have a greater understanding of severe weather. What this teaches you to do is be vigilant and be ready for all weather related occurrences. Excellent Online Course. I Highly Recommend It. Good information that reinforced the concern of safety as the foremost reason for such a program and gives a greater reason to participate as a volunteer. Wonderful course if you want to know more about what it takes to be a weather spotter, or just want to know more about staying safe in severe weather situations. Informative lesson. Some of the quiz questions are misleading but you have the opportunity to retake the quiz. I enjoyed the information. May need some modernization. Great information for a new spotter or review for a seasoned one. Real life examples, spot on instruction. Definitely worth the time to review. The questions in the quiz are poorly worded. This is a great intro to skywarn class. I am using it as part of my training for my local ARES. Good introduction to spotter basics. This lesson was very helpful. Although a couple of the quiz questions were answered in the lesson, the answers were not counted as correct when I feel they should have been based on the information provided. I really enjoyed it. Make sure the answers to questions are apart of the available options. This introductory course should be a "must complete" before you go to your local severe weather class organized by your local weather gurus / emergency management personnel. Good information for beginners and great safety tips to remember. Great program. Wish I had taken the course at home though with no interruptions. This lesson was well planned in a logical order and informative. This course is a great way to becoming a storm spotter. I want to be a SKYWARN spotter to warn and predict convective thunderstorms that form quickly along the North Shore of Long Island, NY. These thunderstorms contain high winds, heavy rain, thunder and lightning and move very quickly I am currently a CoCoRahs observer and have been one for about 18 months.. I am currently teaching a Weather course for the United States Power Squadrons. Well constructed lesson. Quiz was challenging. Very well organized course. I recommend that everyone should review the material to improve their knowledge. I thoroughly enjoyed the topic included and the preferred requirements for the safety of each and every spotter. Presentation accomplished the goal of communicating learning points. I learned a lot about Skywarn Spotters. The video portions of lesson need to be more in-depth. Our family has been a NOAA weather station for years. Extremely user friendly. Should be a basic requirement for all responding emergency personnel. I would like further clarification on types of weather that isn't reported and the "7" key components may be difficult to remember. An acronym for them may be helpful. The lesson taught me a lot of things that I had some confusion on. It is a great class and veery easy to understand. I wish there was an educational part at the end of the quiz to explain why you got something wrong. other than that, good! Very good foundational knowledge of the role of the SKYWARN spotter. Even after retaking the course, there were two questions that I could not get correct after multiple attempts. It may be due to my not understanding the question, or due to the fact that the exact wording of some of the answers may be different from the material presented in the lesson. The information in the lesson was great and easy to follow. I have learned quite a bit about being a spotter and what it takes and how much it means to the community. This media is nearly 7 years old, there have been significant upgrades to all types of media that a spotter may report to. Very good and interesting things I learned today! Good online lesson. I've done the in-person Skywarn training, but I wanted a refresher, and this served that purpose well. This is a great lesson for those wanting to start volunteering in storm spotting. It is well designed and is presented very well. This lesson is very informative. I would recommend it for anyone who is going to become a skywarn spotter. Great training initiative to advise on the proper procedures and actions to take while storm spotting to help the general public. Good overall introduction to the subject. 4 stars was because this is important information for the spotter presented in a quick and useful manner. I would suggest taking this course after a course provided locally. At least in Oklahoma the local course is more thorough and provides regional guidance as well. When it comes to learning they need to tell you what you're going to learn tell you what it is you've learned and then tell you what they told you. This way everything is Crystal Clear what you're supposed to learn. After taking this quiz and looking over the questions that I missed, there is still some confusion as to why one or the other was the best answer. I can go back and review the lesson but I feel like if improvements were made there could be no confusion to the answers. I thought this was a very worthwhile learning resource. Great information that everyone should know! Good presentation of the necessary information. Very complete and concise. Easily completed and effective material. The questions in the quiz require interpretation, and do not clearly correlate to the course material. This lesson greatly helped my knowledge on spotting storms while remaining safe. Good Training learned quite a bit. Very cool and exciting to learn to be able to help others when there is greater threats. Other real-life scenarios for ALL weather-related events and a clear and precise mentioning of how to contact emergency personnel and other NWS personnel to report incidents. Try to make it a little more interactive. I know, safety in a weather event is the key factor. Good overview on spotter basics. I thought this lesson and quiz was perfect for achieving my weather spotter goal. Thank you. Video clips greatly enhance the presentation material. Loved the content. Test questions had a few snags with not being allowed to enter correct answer. Well presented information for individuals and non-emergency response personnel. Informative course. Glad I took it. A good use of my time. Final test doesn't always agree with what I've read on other Skywarn informational pages. (Some pages suggest there IS a minimum age to be a Skywarn observer, that you SHOULD report lightning IF there are injuries.) Is ID number part of my name OR contact info? I don't know. As long as I give the number, does it matter how it is classified? Would like to see test improved. Excellent guidelines that enhance the safety of the Skywarn Spotter and that of the general public. Very interesting, and makes me excited to become a storm spotter. Highly recommend to anyone interested in weather. I would like the questions in the quiz to relate closer to the text in the course. I felt a number of the quiz questions were ambiguous and could have been answered differently. I thought lesson subjects were very well organized. Video presentations were excellent. subjects presented in a manner that made a person stop and think carefully of possible situations one may encounter.Well done. Very easy to understand and work thru the questions. One question does not have a proper answer. Another question is wrong according to an NWS instructor. very easy to follow. very informative. would recommend to any interested in becoming a weather spotter. No closed caption for the Deaf or Hard of Hearing. This is a great tool to learn about being a spotter and also to learn about how to keep you and your family safe in case of an emergecny. I am a licensed amateur radio operator with the desire to be a SKYWARN Spotter. This lesson is an excellent way to start the process. Very good information, not just for potential weather spotters, but for the public in general. Test questions that have ‘check all that apply’ or multiple choice without feed back don’t do anything to strengthen the test taker’s knowledge. I like to learn from my mistakes so I can be accurate in my knowledge instead of leaving me questioning my newly learned info. Your explanation of spotter report elements and the quiz questions are not compatible. lesson is basic and to the point, very good place to start. I learned important information to report hazardous weather. The test didn't make sense. Just do more questions. very interesting, very useful , I would most likely would like to see others use this also. Great information in a well presented format. i really enjoyed the topic. Clearly presents data. Had some troule getting started. Very informative and kept me interested. Comprehensive overview worthy of review. Easy to absorb as an online exercise. I enjoy observing the weather and therefore this a good course to take to help better understand the different types of weather and what they can do. excellent wish I took this 25 years ago! I loved this course. I know I can be a little bit safer while observing storms! To learn is to know. I feel people need to take time to learn things of substance to be more constructive in society. My hope is that others will take the time to learn and then try to apply this education in their local communities. Great information and well taught program. Quiz is a good format but answers are a bit tricky based on choice of words. Overall, good learning tool. Some of the quiz questions are misleading and confusing. Overall, it was an enjoyable course. It was difficult to understand some of the test questions, as the answers in the multiple drop-down sections were detailed beyond what the general course offered. As a novice, and being introduced to the Weather Spotter role this initial presentation was user friendly, and helped to open my awareness. Pay close attention to the subject matter no matter how well you think you know it. The scenarios were interesting but I think a lecture style course would allow for better learning. Enjoyed the class and appreciate the additional knowledge. This lesson was short, sweet and to the point. Very good lesson. Basic but informative. Direct delivery of the "what, why, when, and how" of spotting. Interesting training that shows scope of Skywarn network. I did not know so many people were involved. This training makes it easy to get involved. If you're interested in helping your community to be and have time to escape severe weather, this course is a great course! Some of the questions is missed up i tried everything and still got it wrong! A better understanding of the purpose of severe weather reporting. It was a good experience for a very basic beginning course. I would say that some of the quiz questions were either too open ended and/or confusing. All in all, a very good course describing the basics for persons who may not have any experience. There doesn't seem to be a correct answer to the question which weather event is not reported. I took the quiz several times varying the answers and never got it right. this online training is amazing. This lesson reinforced a lot of safety basics, which I didn't realize go along with hazardous weather reporting. Questions in the quiz can be somewhat misleading. I enjoyed the class. It was easy to navigate and brought insight. The first question on the end quiz is not worded well. The layout of some pages was confusing. Test seems worded to confuse you. Highly recomend this lesson if you arent Skywarn Spotter certifed. Good over view of basic weather related concerns. A great introductory lesson for those looking to get involved in the Skywarn network. very informative and easy to comprehend. I am retired Coast Guard, so I was familiar with a lot of the concepts, especially safety. This is a very good introduction to being a storm spotter. The information is concise and clear with good illustrations. The Format was very educational on areas for spotter's which I previously did not have knowledge on. Portions of the lesson were vague, yet questions on the quiz were specific. Example: Snow was a reportable item, but when and what to report were never specified. The quiz asked for a specific element related to snow. In the spotter conveyance, the spotters ID was to be matched, but it became a guess, because the possible answers did not state spotter ID, so was the answer "name" or "contact" ? The information provided was easy to understand and very informative. Well designed lesson. Gets the information across clearly, and the questions during the chapters help reinforce the items being shown. This information is very helpful in determining weather events. This course is a great pre-study opportunity for anyone. If you want more information to increase your knowledge and be a community asset when it comes to weather related events, I suggest seeking out a classroom course; Storm Spotters as well as looking for a FEMA course offering of Community Emergency Response Team (C.E.R.T.) training. I thought that this was very useful. I was taking an Earth Science class in college and my professor suggested we take this class, i do not regret taking this assessment. Great beginner course. Information presented clearly. Videos were well done. Could be a bit more interactive but all in all okay. I learned a lot from this lesson that i didn't already know. Was great, but would like to see some videos as part of the course. The lesson covered many valuable tips and lessons for reporting on the various dangerous weather, however some items asked on the test were not conveyed properly during the lesson. I honestly found some of the quiz questions confusing. Just as an example:Which of the following is NOT a weather event that can be reported by a SKYWARN spotter?Choose all that apply.Snowfall totalsLightningThunderstormHailTornadoFloodingI tried checking none, but it wouldn't let me. Beyond that, I'm just guessing and there's no place to find the right answer. I tried all of them but was never able to get the answer right. So now I'm questioning what you taught me, and have no way to clarify. Great intro class, very informative as to what spotters do. Feedback from quiz was limited. I have joined the A.R.E.S. in my home county. We also, volunteer as spotters. This is a great step in enhancing your knowledge of what to look for and how and where to report this information to better serve your community. I recommend these courses of interest here at your level and the NWS. Community preparedness is everyones responsibility for response to disasters at home. Well designed and crafted for machine learning. Very helpful, would like to see more information on what to look for in a storm. I took the quiz ten times trying to get a perfect score but I was unable to determine the correct series of answers for the questions with John Doe reporting downed tree limbs and power lines or the question about which weather events were not an event that can be reported. It was quick and easy. Learned a lot in a short time length. This course is very helpful to the Amateur Radio Operators. This is helpful lessons. I recommended it. Great lesson, even if you don't want to be a spotter you should know a lot of this information. I believe this is a very good educational process, and recommend it to any who have a desire to improve their level of awareness of the roll of a weather spotter. Some of the curriculum could stand some updates, such as stats including April 27, 2011, doppler, showing where the spotter lives in relation to radar. This is an excellent orientation to the role of the Skywarn Spotter. Very informative, clear, concise and direct. You live with weather all you life and now to get a chance to take a class to understand what makes up what you have been looking at for so long makes a difference in your life. This is because yo now can have a chance to be part of a process that just may warned and prepared other and maybe save a life. Good introduction to becoming a SKYWARN Spotter. This course was very informative and helpful. This was a great quiz for storm spotters, and definitely recommend it to anyone. This is simply a good introductory lesson. Extremely informative, definitively safety-minded in purpose. It was very educational and helpful. Material was presented in a way easy to remember the topics presented. Some of the questions did not accurately reflect the material covered, in my opinion. Easily navigated, useful tool for basic weather spotter information and safety guidelines. I found that some of the questions were not answered in the lesson content. Also, some of the questions were very misleading. I also think it would be nice to see the right answers to the questions that I have marked wrong. I was not familiar with spotter responsibilities. This lesson was interesting and very informative. Good introduction to the concept. Now looking forward to more technical knowledge. I've taken this before... both online and in person via Memphis and Greenville, SC. This is an excellent refresher course for me. These lessons are great for weather enthusiast who would like to be more involved in helping their community during severe weather situations. tricky quizzes but fun to learn. It is an excellent experience to make this distance learning easy and simple. It is important to be able to help many people with a little work. Congratulations. Excellent basic training course for weather spotters. Worth the time to take. Lots of good information. Interesting and useful info, especially if you want to know how to correctly report as a spotter. The question with no correct answer needs to be re-written. Really Good Lesson. Helped me very much in understanding the info. I believe it was a good lesson and worth learning. However, even after reading through the print out lesson and the online lesson I still was unable to receive 100% on the final quiz. Specifically in regards what the Spotter ID number. This was fun yet informative at the same time. I enjoyed it! To the point, with proper information. With a question that required no answers to be checked to be correct, it is not well engineered that the "did you finish all the questions" checker flagged that right answer as being incomplete. This lesson has very informative content. I'd like to see this module updated to reflect the current times. We have come a long way in 7 years (especially technologically-wise), and there are much more possibilities that we can use to help the Sky Spotter program. We have smart phones now, with all types of ways for contact such as: social media, apps, weather devices, photos, etc. It was informational and quick. It covered the keys components to spotting and how to do it correctly. The presentation is somewhat dry and could be improved upon. BUT has good information. This lesson is really helping in learning every thing you need to know to become a skywarn storm spotter. Informative and easy to follow! Good basic info everyone should know. An excellent source of both information and if you want to make a difference in your community! It was a bit confusing in terms of whether you were taking the training or Actually answering real quiz questions. It had two tricky questions. I thought it was very informative and I learned a few things about reporting procedures. Most of the lesson is common sense. I am a Storm Chaser with Extreme Weather Videos. The lesson is super easy and filled with plenty of useful information. Very informative and well done presentation. You will learn many things of value. It just didn't have the right information provided in it. They didn't have subtitles on the lessons so I had to go by reading it all. this is trash and irrelevant. Just watch weather channel. Very good Lesson. Go over the lesson more than one time before the Quiz. Very informative. Contains important safety information. Lesson was good and revealant, would suggest better audio sessions content is a little weak. This lesson did an excellent job explaining the role of the Skywarn spotter, however there should be a page emphasizing what not to report in spotter reports (for example, winds < 50 mph as per spotter network guidelines). The lesson was good, I do believe some of the test questions are wrong. Good Quiz, but the select all that apply (or none) was a little obscure, having more static choices would clear confusion. Amazing, accurate information. Fast and compatible. Overall , I felt that the information was useful. However there are two questions on the quiz that I was still unable to answer despite that fact that I retook the course. Slides, Video lessons an 11 question quiz, just like my school days. Everything that was shown here is very important for the safety of the spotter and the public. For me this was a refresher course although I had actual In class training and it helps me keep in mind what I learned in my training course. I learned a lot from from the modules and instructional graphs, enjoyed my time taking the quiz and then survey. I thought the training was easy to understand and learn. This module provides enough information to pass the quiz. It is all common sense stuff, but it is important reminder to put safety first. The history of how weather spotters came to be and has impacted emergency response is interesting. it even held my 10 year old's attention, so we both learned something. Overall this lesson serves its purpose well. The only thing I would like to see improved is the format, it's on the older side and I can see where someone could get confused while using this lesson. This lesson was very informative and well presented. Useful information and an easy to understand format. I would recommend this course. In this day and age the ability to make a quality video production with little or no experience is common. Some of the static power point type slide presentation could be improved upon. There was still 1 question I wasn't sure of the answer to even when reviewing the training. It would be great if we could have better visuals, such as better movies of storms. It gave me a much better understanding and it can for you as well ! Very informational! Has history and safety very well constructed! It was a cool quiz! Very good info for someone who wants to be a weather spotter. Very relevant. Great course for storm spotters. Well done! This was a good basic course the emphasized the importance of a SkyWarn spotter and basic overview of the history. This was worth my time, 100%. Thank you for the opportunity. again , these lessons are very helpful and informative . Teaches you the most important part of the lesson: Your personal safety. Good course for learning spotter safety. It would help if when an answer is incorrect an explanation of why the answer is incorrect is given. Format is user friendly. Photographs are very descriptive. Test questions could be narrowed more. Instant feedback on why quiz question was wrong would be beneficial. I would contest a few of the test questions. Glitches! Wrong statements in the dropdown menus. Wasn't told it would be this difficult and frustrating! I would like to see what I got wrong on my quiz. As an NWS SkyWarn Spotter and a CoCoRaHs observer (www.cocorahs.org), I feel that this module contains valuable information for those wishing to become SkyWarn Spotter and for those who are spotters already. I thought the lesson was very good and I'm going to view it again. There were a number of questions in the question pool that were barely touched upon in the material. for example which of the following weather events are not notified by skywarn was hardly covered in the online material while the safety stuff was covered multiple times. Found this lesson to be very interesting. Was able to stay focused. The module could be a little more user friendly. Some of the quiz questions are a little confusing due to the fact that the answers vs the information is not the same. Don't over think any of this. Very informal and learned a lot! The questions were our of sync with the lessons, and the answer key did not make sense in some areas. I love the video content between questions. Suggest any person take this course for the valuable information it contains. This is a very well designed test for this lesson and i enjoyed the way the Skywarn Program education has been updated since i first certified in the early 90's in Casper, WYO. Good background and basic responsibilities of a Spotter. The format was relevant for most "average Joes." Some of the questions were kind of tricky but it was a great experience! I was hoping to have more information on the types of cloud formations that are considered potentially dangerous. It is a good thing to take to be a spotter. Being a rookie firefighter/first responder and now a rookie weather spotter this quiz and lesson gave me a great outline of the basics on reporting weather occurring around me and what to look for. My first step in study of something that has been a life long fascination. I definitively will be back for more. People from my local NOAA office, have been extremely helpful in setting me up. It taught me a few things i never knew before. As a hearing impaired person, I was sorely disappointed at the lack of closed captions, and I have no idea why they were not included. Why not open this up to more people? Really. As an educator, I would encourage anyone who is old enough to participate to learn how to become a weather spotter. I think the service it provides is invaluable. We let kiddos take a course for Hunter's Safety, which could save their life or the life of another, so why not teach our youth to become spotters which could potentially save their life, their families or even hundreds of others? This is a great program. It was easy reading and didn't take much time. Very good, excited to report some weather! This was awesome, cant wait to report some weather. Videos really helped clarify what should be learned from the topic. Well planned and put together. Very Helpful. Gives useful information to the general public. It would be worthwhile for everyone, not just spotters to take this brief course. The biggest take away for me was the importance of personal safety. I will always bear in mind and be guided by the the ACES acronym. Great course, but a little too general. Great, easy to use, interesting and very useful information. Enjoyed this training. I have always been interested in the weather and once considered becoming a meteorologist. I still missed a couple questions, I would like immediate correct answers to the ones I missed and why? The last question is vague. I would want more specific info if i am at the NWS. This course is a tremendous way to engage the weather concepts you learned to the community. A good general review of what is expected to come from a spotters report, and examples of things that can/should be reported. Enjoyed the material covered. Very informative. I would rate this lesson with the total of five stars. It has concise information that pertains to the SKYWARN program and is a great add on to the NWS Spotter training offered locally. I have been a trained spotter for the NWS Pittsburgh warning area for about twenty years. 10/10 would take again; learned about the sky and god's wrath 10/10. Great course, and very informative. The lesson itself was comprehensive and easy to understand. Some of the quiz questions were a touch confusing by asking contradictory questions. As a new subscriber I am finding all information presented to be very useful and helpful. Very easy progression in the lesson. Easy to retain all the information provided. Makes clear the importance of safety above all else. Good Training (Common Sense) and good information. Has all variety of media types- text, video, picture, sound. easy entry level course. common sense! This was a very educational program to learn from. Has some good general information but lacks explanations details on cloud formations. I thought this was a useful and effective presentation. I had to use the non animated version due to my device not being compatible with Adobe Acrobat. The information is presented clearly and plainly. It was a lot of fun learning about my role as a spotter. Good program, especially for Hams. Some of the questions were not clearly written. CAUTION: Trick, ' as defined by' questions used in the exam rather than 'when, then if,' which can cause confusion. Good general introduction to the Skywarn spotter job, and great safety information as well. I really enjoyed the lessons . It was a good program. The only problem is that some of the pages were blank so you couldn't read whatever was supposed to be there. Informative and presented in an easy to understand form. This lesson teaches the aspects of staying safe while spotting severe weather, information needed to report severe weather and other event, and where to report immediate threats quickly. very useful information, good format, easy to follow, knowledge questions along the course. Excellent course, provide the correct amount of information in a condensed format. Edit out extraneous dramatic filler. I loved this lesson and it was very good at teaching! This gives me extra credit it in a university science course. Thanks. As a pilot, I've studied weather all my life (age >55). Now, maybe I can help others. The quiz questions are not as "straight forward" as they could be. They seemed unnecessarily confusing. I will share with my fellow dispatchers in my office, its an easy course, and I now I can report weather happenings here on the campus. I found this to be very educational and helpful, I learned a lot. It also corresponded with the class I'm taking in school. Worth the time. Enjoyed the course. "Focus on your own safety!" seems to be the most important thing presented. The lesson was thorough and very informative. This is a great lesson to learn to become a Skywarn Spotter. It makes people stop and think about something before they spout an answer. Great lesson filled with the information and lesson to help be a great spotter! This was a very good interactive lesson. Very easy, love being able to do this on my phone. i'd like to review the test, in more detail to understand any wrong answers. I feel that this quiz for new spotters is an absolute necessity especially for their safety. A good lesson and should be shared among all people. This was an interesting topic and an easy way to learn! Nice smooth course, didn't take too long either. I'm glad I took it! Great lesson and very user friendly! Easy and useful for general info. I should have 100% on the quiz, however the question in the quiz regarding to matching the text to the spotters communication is either not accurate or extremely confusing. I have taken this test multiple (emphasis on multiple) times with no success to answering this particular question right. I believe that there might be a wrong answer in the quiz for this section. Fantastic basic and safety information. Great simple class for beginners and those in the professional field. It is a very good lesson although it should have more videos on vital points. This is a great basic course to become a storm spotter. Great Course. Lots of great information on storms. Excellent training, with entertaining examples. Only criticism is that a couple of the questions were a little ambiguous in the final test. I really appreciated the opportunity to continue re-testing though until I figured it out to get a perfect score. The lesson was actually rather enjoyable to take and was simple to understand. Greater emphasis on key points presented. I have always been fascinated with weather, was a certified weather observer for a major airline, and wanted to learn how to become a spotter. This just provided me with the answer! Very much enjoyed this course of information! Great way to get certified. Easy course to read through and understand. Great training. Very easy to learn from! This lesson was easily understood. The examples were excellent including the visuals. Highly recommend this to anyone interested in weather conditions. This lesson has good basic information for storm spotters. Very interesting and insightful. Just getting into ham radio and weather spotting is an important function of ham radio. I've learned a lot from this and I hope to help my community be safer. Foe some reason anout half of my anwers did not populate correctly. Very good course and has plenty to teach us all. This is a very good lesson and teaches you a lot. I love how they give many examples and questions to each video and was a very good. However, I did already know this stuff but still was okay because it wanted us to be safety first not, a total eye watcher. Thanks the SKYWARN program and meted. Thanks! Great information and useful tools that can be accessed offline. Nice course, but it would help to put more emphasis on what information needs to be retained. Very helpful for any person, regardless of profession, age, or whatnot. Some of the quiz questions were not clear to me but after going back and reading lesson again they made more sense. I enjoyed learning about the role of the Skywarn spotter. Very good information. Covers the basics for reporting and awareness. This is a informative course. I enjoyed this lesson and learned a lot about the subject. The format was user friendly and the questions were straightforward. Well put together, great info. A great overall experience. A few touches here and there can make this lesson even better than it already is. A magnificent tool that can help us to save lives!! great little info quiz i would highly reccomend researching about type of cloud and lighting. I have experience a ice storm and tornado. I kept retaking the quiz until I got a better score and also learned along the way! The list of required information in the official spotter report was informative. I loved this course! It deepened my understanding of weather. Excellent learning tool to prep people for storm spotting. The scenario in the narrative adds little pieces of the persons personal life that make it more realistic and entertaining to follow. Great job! It's pretty good for a basic understanding of the spotter role. It could use more depth but overall it serves it's function well. this is a great training lesson. i learned a great deal of important saftey and training skills to be used out in the field. Some questions are misleading and contradict themselves. This is a nice introduction, or if you're like me refresher, on the basics of spotting. There were a couple of things that were confusing to me. 1, I thought giving your spotter number was required, since in all examples the reporter gave her number. And I didn't see any weather that would not qualify as something to report. I think some refinement, to make these issues clearer would have helped. Need to show the correct answers after the quiz. Was very informative and easily understood. The scoring results indicated I'd left some questions blank when this was not the case. Still passed so not a huge issue but kind of an odd thing to see. It was informative and I learned some new things. Excellent introduction to weather spotting. Information is presented very dry. The only problem I had was that I did not download the course and my internet connection went out twice and the battery died once while I was taking it. But I had fun with the presentation and the information was good. Program helps to display the important roles spotters play in aiding in public safety in various situations, not just hail, storm, and tornado events. Great information to help you with your training. Very useful and valuable information. I have been somewhat trained by my friends and teammates on Metro. I thought the teaching and testing were very understandable and knowledgeable. It is in line with my other safety training in the fact that personal safety must come first to be able to complete the task to help others. this was a great class. I think i liked it better this years since i took in online compared to my other years of going to a in person class the last couple of years. Great way to lean how to be a spotter. Really good program! It was a well organized, thought provoking lesson. More personal accounts would be very effective. Thank y'all so very much for providing accurate, important information that will further assist in providing accurate weather information to the public. Great job! This lesson was easy to understand. It took you step by step in every situation possible. I would highly recommend this to anybody wanting to do Storm Spotting. The lesson provides the basics to become a safe storm watcher and the quiz reinforces the material. There were some things that I did not know when reviewing the lesson. I strongly advise that people read the lessons and quiz themselves before taking on the force of weather. It would be helpful to have more scenario's just to help reinforce the protocol that is used. Also now that twitter is a very common use it would be helpful to have a section on what the twitter protocol's look like. In all though the content was helpful. Only one of the questions was a bit confusing. I look forward to completeing many other courses here online. This lesson was very informative. solid overall lesson. certain descriptions of situations that unfolded seemed a bit corny, but the situations themselves are very serious and should be treated as such. rookie storm spotters can learn quite a bit from this. Not all pages appeared in the module - perhaps because I was using an iPad. It was infrequent but still annoying. Really great lesson! Learned a lot. Great course, really covers the basics of storm-spotting. The online training has improved but the quiz has a couple questions that tricky. Good overall introduction to the Skywarn program with important emphasis on personal safety- We are NOT 'Tornado Chasers'! Some media updating to more use of video will likely occur in the future. I found a few of the quiz questions to be based on points which were not (to me) emphasized strongly... but maybe I didn't pay close enough attention. IF you do you will likely pass- maybe score better than I did- but will surely be educated in this important area. Was very informative and explained the truths about being a weather spotter. A very concise & informative lesson. This is an excellent tool to boost understanding and distribution of knowledge to more potential weather spotters. Very well put together training program. The course was made more interesting by combining written text and video. Great refresher for me! Sometimes we get caught up in the drama of an event unfolding, this was a great reminder on how quickly something can happen and how to always stay safe! It would be cool to do field work like track a tornadic storm in the training. The material presented was the same as normal training, informative enough, but somewhat repetitive and time consuming. Faster than a normal training meeting, though, since you can read at your own pace. Having no prior experience, I feel that this course was very helpful and informative. Very informative and direct in the lessons. Very well organized and easy to navigate. Good test to take. Information is relevant. Informative and interesting. Worthwhile pursuit of knowledge. Great beginning course for learning how to communicate as a spotter and safety situations. Excellent lessons to be aware of. An excellent basic level course for beginner Skywarn/spotters. I just feel some of the topics could be explained beter, also with that being said I also feel the videos can be a little more informative. Pretty well done, as a past Firefighter in Michigan this was a great review for me to re-certify! Good stuff for all spotters. Basic, informative and gets the point across. Excellent introductory program. Well thought out and easy to understand. Good course. I recommend it to anyone new to weather spotting. Knowledge learned from TV weather forecaster discussions. I would add in a couple of things, how to accurately determine the size of hail, the amounts by depth, and how to measure rainfall. Just something I am suggesting. I have done it before myself, but others may not know how accurately to do this. Nifty little module packed with information that wasn't terribly dumbed down or patronizing. The information presented was very good. Write down your quiz answers at the end! You'll receive indication of which ones you answered incorrectly, but it doesn't indicate what you answered or what the correct answers were - not helpful if your goal is to really learn this stuff. Information seems random and elementary. A "live" video presenter with visual aids would be more suitable. The material was good and provided a better understanding of the role of a spotter. On the question about the important components of spotter's severe weather observation report, you'll need to drag and drop the answers from the right column into the correct order on the center column. When I took the quiz, there were no instructions other than to "match" them. Good information given in a concise format. Useful information that was neat to learn. Very helpful though a bit antiquated. This is a great step in learning personal safety and learning to spot storms. Seems like a lot of 'check all that apply' that seem tricky. Good intro for beginning Skywarn volunteer. I recommend this training to other spotters that may have only taken the local spotter talks given by the NWS. It goes into more coverage of the basics of spotting, and does it in a not-so-technical way, as it would be during spotter talks. The flow of the information prior to the quiz seemed appropriate. Flows smoothly, Videos are a good length for interest and retention. Some of the questions are very vague. When answering some of these questions, what are suppose to be right are marked wrong. Still made a 91% first time. So this shouldn't be an overall issue. I feel it made me more aware of the importance of staying safe. I think this prepped me best for becoming a proper skywarn participant. Great module together you started! The format was good in that there was a mix of graphic images, videos, and text. The frequent quizzes help the learner but focusing on important concepts, though not all concepts on the final quiz had been covered by the preliminary quizzes. This is a great way to become involved with the community. very good lesson. perfect for any weather enthusiast. also makes sure your keeping people safe the right way and yourself to. A few of the test questions are ambiguous. Great experience using the knowledge provided. I hope can find this straight forward approach to Spotter safety useful. Knowledgeable and easy way to learn and complete the course. Good lesson but videos are a little slow. Some of the test answers seem a little ambiguous. Overall, very helpful. This lesson was helpful because it uses situations you could be placed in as a storm spotter to help you learn the correct actions to take. I found it very helpful. In my opinion,it is of great use for those who want to become a skywarn spotter.however,it can not meet the need of meteorological teachers and students and just let us know the program. Good introduction to being a spotter. Some of the information about means of communication could have been presented with a bit more clarity. Great lesson for those interested in weather! The lesson was well designed and informative, I had some preconceived notions about certain scenarios that the lesson did well to correct me on. I was quite annoyed by lack of ability to access the correct answers for the questions that I answered incorrectly on the quiz. I would have liked to have seen where I went wrong, but it didn't appear that that was possible. That really should be a feature, and if it already is, it should be far more obvious. The Skywarn Spotter test was extremely interesting to take. I love learning about weather. Good overview. I would like to see more information on questions missed so I can review the relevant section. Good review of the concepts and practical real life situations. This lesson is good for audio-instruction of possible situations as well as the availability of multiple choice questions that are scattered throughout the lesson before you take the quiz. Read and listen to the presentation carefully and take good notes. I would make sure that you go through the lesson more than once. Be sure to study up! I am using a kindle fire device and therefore unable to utilize the plugin devices. Since it is easier for me to use this than my laptop, it would have been more useful to have had the option to watch the videos prior to test taking. The quiz targeted several good focal points but not a complete quiz for skywarn spotters as to majority of quiz was over primarily one objective which is to report, however I feel in order to report as a skywarn spotter its imperative that additional material in regards to visual focus on hazardous weather events/severe weather, guidelines on what to report and why, no additional scenarios needed that section is adequate unless you improve it as an actual video of a skywarn and or chaser near the area of present hazard with an indication of commentary as to things to do which could easily be obtained by request of individual uploaders contact information on YouTube there are thousands of videos that are severe weather related and could possibly be used as informational and educational purposes. Read uploaders information below any video, usually the uploader has own website in which the uploader could be contacted directly. If you are a weather nerd like I am this course is very much what you need. Great Course and I will highly recommend it to others. I would of liked to review my test answers, I'm pretty sure my score should of been higher than 77%. Wonderful experience, I found it very informative and concise! Solid course. Relevant to my work field. Not all multiple choice answers were displayed on the question about the most fatalities from a weather event. Rather boring, did not exactly say what to look for. Just how to report it. Informative information for anyone who loves weather. it was fun and interesting to learn about. Even if you are not willing to become a spotter, the information would greatly benefit the common person with the safety and knowledge contained in the lesson. Easy to navigate and understand. Good examples.